How a dodgy ideology made the rich richer, the rest of us poorer and left the economy in ruins. Around 1980, something changed: a seemingly unstoppable evolution in western societies went into reverse. For half a century the gap between rich and poor had been narrowing: an inevitable consequence, it seemed, of universal education, mass production, trade unionism and the rise of democracy. Yet within a few years this trend had been sharply reversed. In the subsequent three decades, the western world has witnessed a dramatic growth in inequality. The top 1% have appropriated almost all the fruits of growth, while middle and low income groups have stagnated or worse. 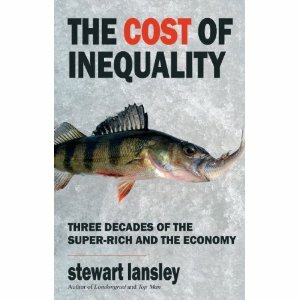 Stewart Lansley’s new book, ‘The Cost of Inequality‘ (Gibson Square, 2011) looks at why this happened, and what have been the consequences. His central argument, impressively documented in a tour through the workings of modern capitalism, is that growing inequality caused the financial meltdown of 2008.